Beans, lentils and peas—also known as legumes—offer so many great health benefits, from being high in folate, iron, potassium and magnesium to being low in fat and containing no cholesterol. They’re also a great source of beneficial fats and soluble and insoluble fiber. And, if that’s not enough, they’re also a good source of protein, making them a healthy substitute for high fat meats—think vegetarian burgers! 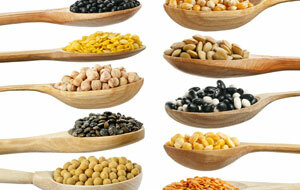 Here are some of the most popular legumes and they’re uses. Black beans are a great choice for Mexican dishes, rice dishes and soups. From black bean and couscous salad to a black beans, corn and rice dish, black beans are one of the most popular beans in the supermarket. Black-eyed peas are a great choice for casseroles, salads and Southern dishes. And, of course, New Year’s Day Black-Eyed Peas! Commonly known as a soybean, edamame is popular served as an appetizer or a snack—lightly boiled in water and then sprinkled with kosher salt. Edamame is also great for salads and rice dishes. Lentils are a great choice for casseroles, salads and hearty soups—like low fat turkey sausage and lentil soup. Also known as “butter beans,” lima beans complement a wide variety of foods and dishes. One classic winter dish is ham hocks and lima beans! Red kidney beans are a great choice for chili, rice dishes, salads and stews. If you’ve never prepared dried beans before, here’s a cooking tip: Pick through dried beans and discard any discolored of shriveled beans or any foreign matter, like pebbles. Soak beans before cooking to help rehydrate them for even cooking.